Your first dentist visit will, most likely, be a unique experience. Dr. Rehme will introduce his concept of dental care known as Biological Dentistry (Holistic Dentistry). This health oriented approach not only addresses the oral cavity but evaluates its relationship with the rest of the body. We’ll ask you to fill out a thorough health history including a dental and nutritional questionnaire to provide us with the information we need for this initial consultation and clinical evaluation. Before the dental examination begins, your dentist will sit down with you for a short consultation to discuss your dental needs and to answer your questions regarding biological holistic dentistry. We’ll address your expectations and concerns before any dental treatment or services are started. Good communication is a key to a successful and predictable outcome for both of us. The dental evaluation consists of checking each tooth for any compromised conditions i.e., decay, fractures and existing dental restorations that may be leaking or failing due to excessive wear and chipping. We’ll identify any teeth with mercury fillings, root canals, or implants and chart the periodontal (gum) condition of each tooth. 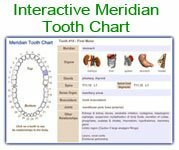 The periodontal charting (which evaluates the healthiness of both the bone support and the gum tissue surrounding each tooth) is a critical step in providing valuable clues to the condition between your teeth and the rest of the body. A full mouth series of X-rays is necessary to provide a complete and accurate dental health analysis. (If you have any existing X-rays, they need to have been taken within the last year to provide us with the appropriate diagnostic value). We’ll also perform an oral cancer screening, tongue diagnosis and temporal mandibular (TM) joint check. We’ll check the muscles of mastication for signs of grinding and bruxing, your saliva pH, galvanic current for each tooth that contains any dental restoration, and a mercury vapor analysis. Several of these tests are not commonly done but at our dental office, we do them because they’re extremely valuable for your own insight to the true condition of your dental health. They are increasingly getting attention from a growing group of biological dentists nationwide. Intra-oral photos are taken to illustrate what your current dental work looks like. They guide us in providing suggestions on how to restore your dentition and/or improve the periodontal condition. Usually your initial dentist visit will take 1 – 1 ½ hours to complete. Once the clinical examination is concluded our next step is the Review Of Findings. There’s no charge for this Review; it’s already included. It usually occurs at a subsequent dentist appointment. During your dental review, your dentist will recap all your dental information that’s been collected, provide an assessment of what it means, and answer your questions. A personalized dental treatment plan is created to promote a healthy, compatible, and aesthetic result for years to come. We’ll also provide you with a folder before leaving our office that contains numerous educational articles pertaining to biological dentistry and nutritional support. This should immensely aid your learning process and assist you in making decisions that are best for your health and well being.